The Governor of Lagos State Akinwunmi Ambode will face the fight of his career in the next few hours, but already supports is flooding in for him. Governor Ambode, who is seeking re-election despite the withdrawal of support from his God Father, launched a fight back against those who say he must stand down his ambition for 2019. Those who want the Governor to step down have endorsed Babajide Sanwo-Olu, a preferred candidate of Bola Ahmed Tinubu. The Vice President, Yemi Osinbajo a known ally of Asiwaju Tinubu meet with Mr Sanwo-Olu today. But instead of backing down from the race as expected, Governor Ambode surprised everyone with the announcement of a Press Conference hours before the primary elections. The Guber primary of the APC which is scheduled to hold in Lagos on Monday has been postponed twice already. There are rumours it could be shifted to Tuesday (October 2, 2018), due to infighting among leaders. At the emergency World Press Conference held today, the embattled Governor defiantly noted his strong believe in the tenant of democracy. Governor Ambode, who has also served as Accountant General of Lagos said the APC will jeopardise its victory in the state if it fielded Mr Sanwo-Olu has its candidate. Hours after the conference, members of the All Progressives Congress, APC marched to Ojota, Lagos in support of Governor Ambode. 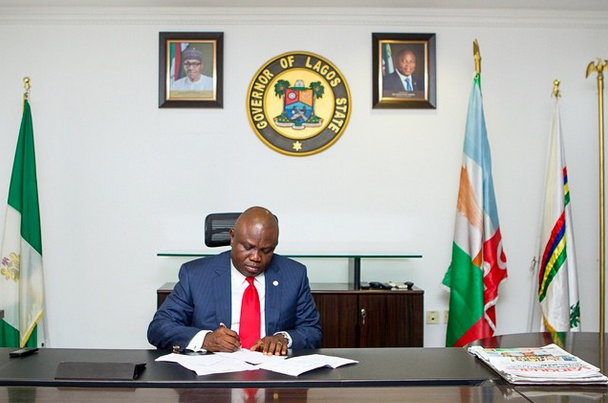 This was also followed by a declaration from all the Councillors in all the 20 Local Government Areas and 37 Local Council Development Areas (LCDAs) of Lagos State who say they are in support of Governor Ambode’s second term bid. Despite outcry from the public, a recent statement from the House of Assembly stated that it had decided to support Mr Sanwo-Olu. However, a latest backing from an important grass root movement in support of Governor Ambode is a massive believe in his mandate to serve the people of the state. In Nigeria, Councillors are the link between an executive and the people they aim to serve. The Director General of Ambode Mandate Support Group, AMSG, Hakeem Sulaimon said the councillors should be praised for being courageous. He leader of the ruling party, who should have been its conscience have failed, but the councillors did the courageous in their support of Governor Ambode. “I congratulate you because those who are supposed to be the conscience of our party have failed to do so but you (Councillors) have been courageous enough to come out and endorse His Excellency, Mr Akinwunmi Ambode, the Governor of Lagos State for second term,” Hon Sulaimon stated. He said: “We had a meeting with Councillors here and while the meeting was going on, some people quickly went online. Those behind the false news know the implication of the endorsement because Councillors are truly the grassroots’ managers because elections can only be conducted at the Ward level and that Councillors are the true representatives of the people at the Ward level.